The next Sinema screening is coming right up! This round, we’re bringing you a trio of short films by Jacen Tan: besides the enormously popular Tak Giu and Zo Peng, Sinema is proud to premier his new production Zo Gang. 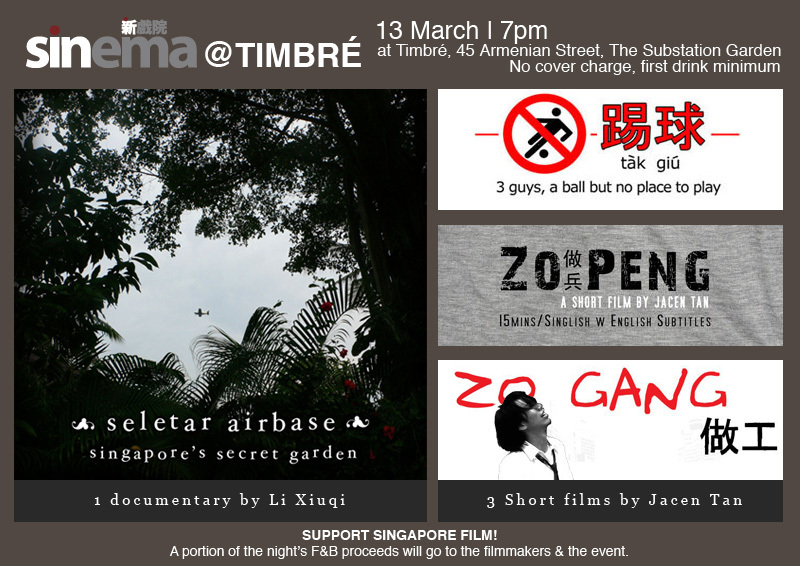 That will be followed by Li Xiuqi’s short film, Seletar Airbase: Singapore’s Secret Garden. The film screening will be held on Tue, March 13 at 7 pm at TimbrÃƒÂ© at the Substation. There’s no cover charge — just buy a drink, then hang out to enjoy the films. The filmmakers will also be around to field questions and comments.